In the late 1990s, there was a underground movement brought to light in the Austin music scene that brought forth some amazing punk/metal bands. It was a true scene, with bands working together to make amazing music and provide a safe and open place for kids of all ages to dance, mosh, express themselves, and most of all, get infected by the music. Although I wasn’t here then, as I didn’t get to the area until 2006, I’ve come to know quite a few of the folks who were dynamic parts of that scene just by being interested in and seeking out Austin music. One of these is the former frontman for Riddlin’ Kids Dustin Stroud, who formed Say Hello To The Angels (SHTTA). 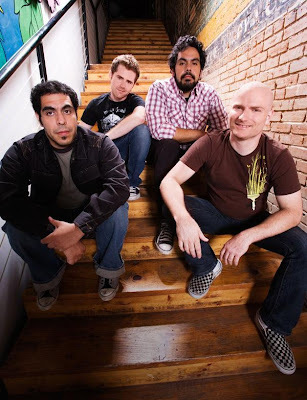 SHTTA is Stroud (vocals), Ben Benitez (drums) and Raymond Benitez (rhythm guitar) who were in Rubberhed, and TJ Smyrson (bass) who joined from ska/punk band The Buzzkillers. I had a chance to ask Stroud a few questions on the day Stay Awake, SHTTA’s third full-length album on Altercation Records, was released amidst the craziness of the “week of music” in Austin, Texas. Sean Claes: Tell me about your name? 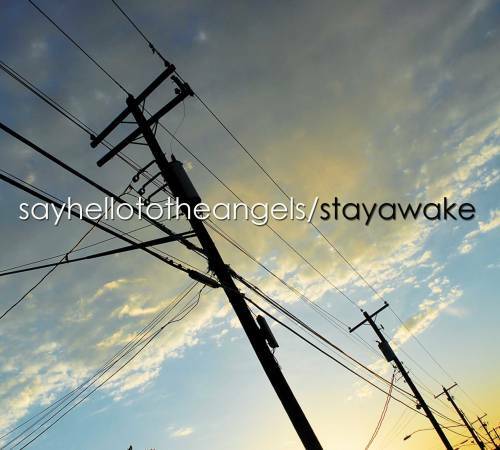 From where did Say Hello To The Angels come? Dustin Stroud: We were looking for something positive… and to tell you the truth all of the good names were taken. When we started the band 20% of all money we made went to charity. Our first EP sold for $5.00 and $1.00 from each CD wend to Any Baby Can, a local Texas charity that supports Newborns and their parents. I was our desire to make an impact musically as well as socially. We still strive to do that. It gets complicated when you are on a record label (Altercation Records). We still do charity work, and we are always looking for ways to make a difference. Claes: All of you have experience in a band that has elevated above the local scene in the past. What makes this round with SHTTA different? Stroud: I think that previously our prospective bands have been part of a specific scene, and were a byproduct of influences that were growing organically out of the music community. Bands like Dynamite Boy, Shaft, Rubberhed, Riddlin’ Kids, Born To Lose, Cruiserweight, Fire Kills and all the other bands that came up in that scene, we all influenced each other and pushed each other; it was like an “arms race” of punk rock and rock and roll. That was maybe the most productive time for music in the Austin scene, debatably of course, I can only speak from experience. SHTTA doesn’t have an angle, and we are not part of a cohesive scene. The scene is fragmented now and although there is still great music happening out there. The wagons don’t seem to be as circled as they used to be, and attention spans from the consumer audiences have never been shorter. The positive of this is that anything is possible and it’s anyone’s game. Musically I think we mine deeper wells than we previously have. We have reconnected with some of our earlier influences, and reconciled them what really turns us on about modern music today. Claes: Tell me more about the Austin music back in the time of Dynamite Boy, Rubberhed, and Riddlin’ Kids. Stroud: It was definitely a “golden era,” and the media at large at the time looked at it as a “golden error.” It killed them to have to write about a sold out show at the Back Room. I always wondered why all those bands getting signed and touring nationally were not a big deal. I think Austin sometimes has an inferiority complex and only feels validated when people come to pillage twice a year for SXSW and ACL. I hope if the Austin youth culture ever gets its stuff together again, and makes a go of it, that there can be cohesion from the media, commentators and critics. That being said, radio was behind all of us at the time, and that was really something that put it all over the top. Funny huh? You put something on the radio locally and it’s good for everybody… one big happy community and healthy growing music scene… Hmmm, maybe that’s just a coincidence… I do want to thank all those responsible in the media and radio, they know who they are, INsite included, that have helped to foster and cultivate music as a culture and community. Claes: What do you feel you took from your previous bands to add to the SHTTA sound? Stroud: I think we are a good sum of our collective parts. We also take a great work ethic with us. All three bands we came from worked and played hard. We feel super lucky to have gotten to do all the cool stuff we did in our old bands, we feel privileged to still get to continue playing and making music. Claes: Your debut EP came out in 2008, Modern Fire came out in January 2011, Break Your Sword in 2012 and Stay Awake released on 3/12/13. How do you feel you’ve progressed as a band in the last few years? Stroud: I think we have matured musically and personally, quite a bit in the last couple of years. Benjie and I have went and gotten ourselves married. As we get older instead of fading out, music has gotten more urgent for us. We definitely take it more seriously and appreciate it much more. I couldn’t imagine not playing and writing music with my friends. Songwriting wise I think we have just hit our stride. It has taken a long time to figure out what we sound like. It’s one of those the journey is more important than the destination things. I’m really excited to hear how the next record will sound. Claes: This is your third record on Altercation Records. How is it working out with the label? Stroud: It’s great working with Altercation. They are actually half Texan now. Several years ago, one of the partners from Altercation moved down here from Kingston, NY. The other Partner is still up in NY, so they cover a lot of ground, have great distribution, and really believe in our band. It’s one of the great things about being on a boutique label, you get a lot of face time and attention from the label, and it gives your band adequate time to be developed. Claes: While listening to Stay Awake, I couldn’t help but think, “Hey, these guys are kind of the Dropkick Murphys of Austin” since I hear that Irish folk-punk sound in your music, but you certainly have the Austin feel. How would you describe your sound? Stroud: Hey, Thanks! I don’t know how we would describe ourselves… Whatever the kids are calling it these days. We think of ourselves as Post punk… you can check  OTHER on the list I guess. There are definitely a lot of influences in the wood pile. We love the pure punk stuff, but we are metal heads at heart. I guess we should get that one straight, it’s really important to know who and what you are. We have always placed more importance on songwriting and songs, than the general vibe or sound of a thing. I think it’s just lucky that we sound good together. Claes: What are some of your favorite tracks off of Stay Awake? Stroud: My favorites are “Oh Gloria” and “Genevieve,” just at the moment, because they were the most fun to record. Claes: The video for your new track, “Oh Gloria,” was released on BlankTV’s YouTube Channel and has gotten over 3,700 views in 2 weeks. Awesome. Tell me about the making of the video. Stroud: Oh man, we had fun recording that video! Actually we recorded three videos at the same time. “Oh Gloria,” “Never Walk Alone,” and “Forsaken.” Incidentally, “Forsaken” has over 18,000 views on Blank TV. Our label owner, Travis Meyer, invited us up to NYC and the tri-state area to play a string of shows and record as many videos as we could get done in a day. Travis had the best work ethic I have ever seen, and he cracked the whip on us and got those videos done. The director and film crew was awesome, and they have recorded many videos for our other label mates, and people should go on Blank TV and check all of those out! We filmed the videos at Snapper McGee’s and the surrounding streets in Torrington, CT. So the day we did it we filmed three of our videos, and Lost in Society, our label mates, recorded two. How is that for Punk Rock Ethic? Claes: Looks like all of Austin has gone crazy with music to celebrate the release of Stay Awake this week. Where are you playing and when? Stroud: Awesome! Thank you Austin, you are so selfless with your $20 parking and your hordes of uninterested industry types! Kidding. Thanks for eating all of our chips and salsa boys and girls, tip the petty cabers, and please put your trash in the proper receptacles. On Tuesday we played an Altercation Records Showcase at the new “Metal and Lace” (formerly Headhunters). We are also playing Saturday the 16th at the Vortex on Manor Rd. This is the now famous Punk Rock BBQ. 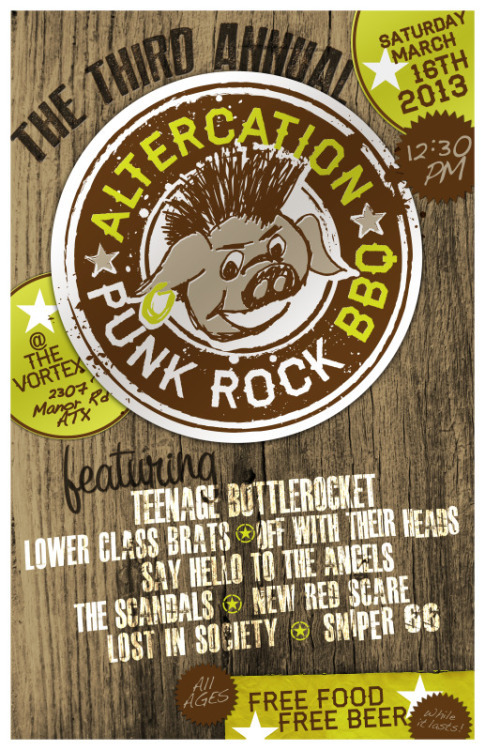 There are some awesome Altercation bands playing that day, also Teenage Bottle Rocket and Off With Their Heads is playing (two fat records bands). It starts about 12:00 noon and goes to about 5:30. There will be snacks and libations. Claes: In 2012 you played the San Antonio, Dallas and Houston dates of the Warped Tour. How was that experience? Stroud: That was Awesome! We played on Brian Marquis’ Acoustic Basement Stage, and it was in support of our acoustic record Break Your Sword. So many great performers, Chris Roe from the Ataris, Anthony from Bayside, and Vinnie from I Am Avalanche, just to name a few. Our acoustic performances were very well received; it’s a totally different experience from our electric shows. Warped Tour is a great opportunity to connect with a really wide demographic of fans. It’s amazing how relevant Warped tour remains today. As all other full touring festivals have cut back to a few day events, Warped is still going strong. It’s like an awesome Punk Rock Summer Camp! Claes: What was your favorite show to play as SHTTA to date? Stroud: So far it’s got to be the Duke Nukem Forever video game release party we played in Dallas for Gearbox. It is awesome to have done the theme song for that game, and to get to play the musical score to some of the game-play levels. The show was epic, and we got to meet the guy that does the voice for Duke… “Hail to the king baby!” Duke Nukem Rules! Claes: What does 2013 have in store for you? Stroud: We are going to get started writing for our next record, do some more videos in New York, and play as many shows as we can. Claes: Who are some of the bands folks around Austin should check out the other 51 weeks of the year? Stroud: In no particular order: Devils and Dust, Thieves, Stampede, Mike Truth and the Replacement Killers, The Riot Scene, Threes Away (new videogame mobile app for iPhone and android), Nowhere Bound, Brady Black, The Buzzkillers. We are super blessed to have so many awesome bands in this town, go check them out and if you find something new and cool, please tell me about it! Thank you for always supporting us, please check out our TUMBLR, FACEBOOK, TWITTER, and our music on ITUNES.